Insane Customer Focus – Customers will buy only a simple product with singular value proposition. Think Differently – Take the contrarian route. Create novel solutions. Wireless charging of gadgets such as laptops, cell phones and MP3 players is soon going to be a reality, according to US researchers from Massachusetts Institute of Technology (MIT). The presentation, which was made on 14th November, showed how wireless electromagnetic energy could power gadgets over distances of three to five meters. The three MIT researchers have suggested that the principle of resonance, which occurs in musical instruments, can apply to gadgets as well. Professor Soljacic, one of the researchers explained that if two resonant objects with the same frequency are brought close enough to each others’ tails of energy, then electromagnetic energy can transmit from one object to another. In the same way, the resonance of electromagnetic waves will be allowed to radiate, via copper antennae, designed to have long-lived resonance. The antennae could then transfer energy to a laptop with the gadget’s own antenna resonating at the same frequency. In this set up, any energy which is not diverted into a gadget will simply be reabsorbed, instead of being scattered in different directions. Although the team has not built and tested a system which could put their theory into practice, computer models and mathematics suggest it would work. Bar Camp Bangalore kick starts!!! The topics seem to be pretty good with focus on entrepreneurship as well. Yaari.com is the next in the assembly line of social networking sites on the internet, launched by a 24 year old Indian alumnus of Stanford University. Apart from the usual customizable profiles and media uploading, the site also has apps such as Yaari Mobile, which will allow people to network on their mobile phones via SMS. CEO, Prerna Gupta, who prefers to be called ‘Chief Yaar’, explains that the USP of this site is the fact that it is truly desi and comes with the tagline, ‘Created by Indian youth, for Indian youth’. Gupta says her goal is for Yaari to be a platform where Indian youth express themselves freely. Moreover, Yaari.com will also be hosting the official Mr & Ms India Online pageant this month where winners will be determined by popular vote, along with a panel of judges. Gupta, and co-founder Parag Chordia, say that their site offers a more exciting and rich user experience than the leading competitor, Orkut, since Orkut is all about scrapping, and users eventually get bored of that! Yaari.com, on the other hand, is aiming for greater long term appeal in the Indian scenario. However, unlike other social networking sites, Yaari will be an invite- only site, with invitations being restricted to the ‘right kind’ of Indian youth. The founders hope to attract 1 million users in the first year. Rest assured, while Gupta tries to figure out how to make a judgement call on the ‘right kind’ of Indian youth, somewhere in another corner of the world, another bored Yale/ Stanford / Wharton graduate is wondering how to cash in on his Desi roots. Alcatel and Lucent Technologies have finally decided to tie the knot and merge their two companies, in what amounts to be a gigantic first step in the telecom hardware consolidation. The combined company will have a market capitalization of $36 billion, and will have sales of around $25 billion and will have 88,000 employees. This is not really a merger of equals, and if you read the terms of the deal, its Alcatel swallowing Lucent. Serge Tchuruk, chairman and CEO of Alcatel who will become non-executive chairman of the combined company and Patricia Russo, the chair(wo)man and CEO of Lucent will become CEO of the combined company. The carriers desire for IMS, the technology that would let them merge the wireline and wireless networks. Lucent has done great work in that space, and the combined company will do well because of that. In addition, it solves Tchuruk’s transition dilemma. He did not have a #2 and with his time was running out – well you know how it is!!! Bharti Airtel Ltd. (532454.BY), India’s largest mobile phone service provider by subscribers, and Google Inc. (GOOG) Thursday announced a partnership that would allow Bharti’s customers to use the Google search engine. “Mobile users outnumber PC users in India by a factor of six,” said a Bharti statement, quoting Manoj Kohli, president of Bharti Airtel. Google will incorporate advertisements when Bharti’s mobile customers use the search engine, the statement added. Kohli and Sukhinder Singh Cassidy, vice president of Google’s Asia-Pacific and Latin American Operations, held a joint press conference on the tie up. Both declined to comment on the revenue expected from the advertisements. Bharti Airtel had 28.61 million mobile service customers at the end of Oct. 31, 2006, according to the company statement. Tata Consultancy Services (TCS), the $3-billion IT outsourcing major, has bagged a $65-million, seven-year deal from the $10-billion UK retail chain, Somerfield. By TCS’ standards this isn’t a very large deal but it is unique because this is arguably the first time an Indian IT company has won a full service contract. This means that TCS will be responsible for developing and maintaining customised software and keeping off-the-shelf hardware and application software that Somerfield uses up-to-date. Normally, Indian companies win a part of the contract that deals with the development and maintainence of customised software first and then work their way into other things like infrastructure management and package implementation. This is a good development because TCS won this deal against global majors who do these deals regularly. “We believe if we do this deal well then the client will look at us for managing their discretionary spending on IT later on,” says Phiroz Vandrevala, global head (corporate affairs, TCS). TCS also believes that it has been able to structure the contract in a way that will not impact its margins. What has it done differently? Normally full service deals require the service providers to take over all the assets — hardware, software, people — from the client’s books to its own. Not in this case. TCS will not take over the hardware and off-the-shelf software. “They will remain on the client’s books. We will manage it as if it was our own but the cheque for these will be written by the client directly to those vendors and we will get management fees for this advisory bit,” says Mr Vandrevala. Since off-the-shelf hardware and software are low-margin business TCS will avoid any hits to its margins. IT industry analysts realise this but feel it is not bold enough. “I think they have stopped a shade short making this a total outsourcing deal. They will have to consider taking the entire operation on their books in their future deals because it makes the life of their client much easier and it also delivers bigger topline growth,” says Siddharth Pai, partner, TPI, an outsourcing advisory firm. Mr Pai may have a point there because if this contract were to be done by a global outsourcing major it would have been at least 2.5 times bigger in revenues, albeit less profitable. This contract is a fixed-price one, an Achilles Heel for Indian companies. TCS seems to be on a safer grounds here because it does more business on fixed-price contracts that any other indian companies. “Since the contract has a large infrastructure component to it and appears less project-oriented the risk of margin loss appears to be less,” says Mr Pai. TCS has shown more purpose by announcing that approximately 115 people will lose their jobs in Somerfield’s UK operation. This shows the changed environment as far as outsourcing is concerned. Three years ago, any mention of a job loss due to outsourcing would have been considered blasphemous. TCS has also shown some good political acumen by stressing that these jobs will move to the TCS’ UK operations and therefore the country will remain job-neutral — for the time being. 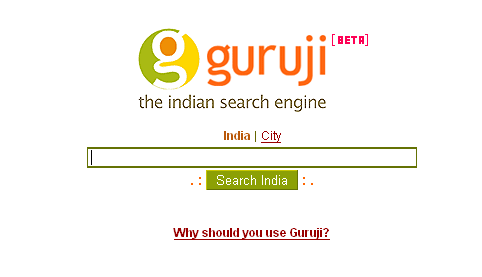 Guess what, their business is also targeting the Indian audience who want a change from Google.Yes,Guruji.com is a new company which also be in the same business as Google(which will enter the booming business of Search Engines.It will take competition with Google,forgotten hero ask.com , Yahoo Search and other engines engine seems to be pretty good and is molded on googol lines. Guruji.com has been funded by Sequoia Capital India(www.sequoiacap.com/india) and Angel Investors. There are lots of interesting things to watch out for Guruji.com . 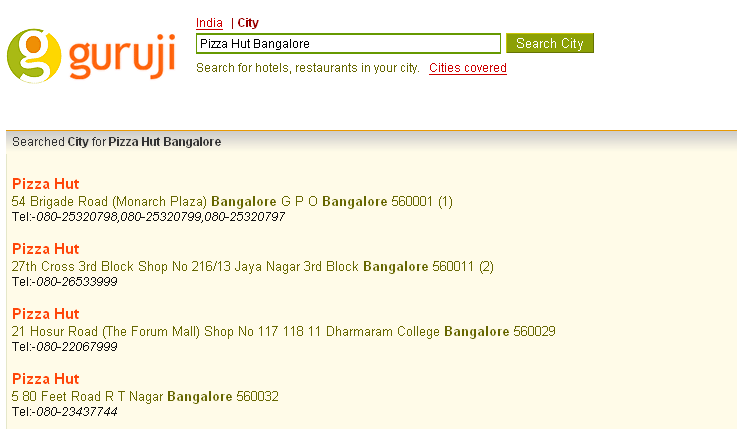 Apart from being Indian and searching only Indian based pages,it allows the users to search for restraunts,hotels in any city in India just by giving the Hotel name and city.